During my research on the very basics of Social Media I have encountered various approaches, solutions, and problems. Certainly most of the information found on this topic online is very unprofessional, but still there are some researchers who have succeeded in providing academic frameworks to identify what SM is. One of these works come from Kaplan and Haenlein (2010) who have provided not only a good definition of SM, but have also also successfully classified different SM types. Kaplan and Haenlein denominate that the first website that can be considered a modern SM service, was Open Diary, a service that allowed the creation of public, semi-public, or private texts which could be shared with a community. Open Diary was the prototype of todays blogging services. The terms “webblog” and one year later “blog” were invented around the discussions about the success of Open Diary. The publishing capabilities in combination with the upcoming of more sophisticated social communities via social network services “coined the term Social Media and contributed to the prominence it has today” (Kaplan, Haenlein, 2010: 60). Kaplan and Haenlein were able to identify and discribe six types of social media. (1) collaborative projects (e.g. Wikipedia), (2) blogs and microblogs (e.g. 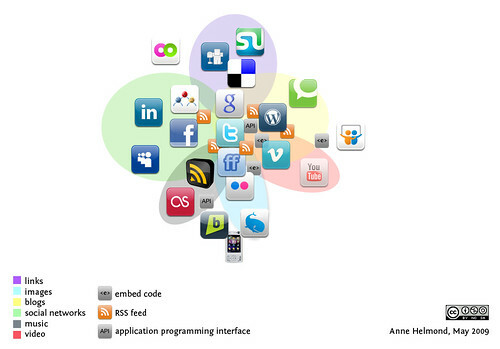 WordPress, Twitter), (3) content communities (e.g. Flickr, Youtube), (4) social network services (e.g. Facebook, Orkut), (5) virtual game worlds (e.g. World of Warcraft), (6) and virtual social worlds (Second Life). This classification is very useful for researchers and certainly one of the few consistent approaches to this topic. Still, there are certain limitations to it, which have to be overcome in the future to further understand what social media is. One of these limitations is the nonobservance of personal identities in digital environments. The often ambivalent coexistence of anonymity, pseodonymity and real identities are not considered by Kaplan and Haenlein. Certainly would this add another axis to the diagram above. More on the topic of identities in digital communication can be found here and here. KAPLAN, Andreas M. & HAENLEIN, Michael (2010), “Users of the world, unite! The challenges and opportunities of Social Media”, Business Horizons, vol. 53, 59-68. This entry was posted in Identity and tagged Anonymity, Classification, Definition, digital, identity, Internet, Online, Pseudonymity, social media, social network, Web 2.0 by Lucas Braun. Bookmark the permalink.